4-0 in MLB Friday for +4.21 Units! Some thoughts. On Friday we had 6 plays. Our 4 MLB Overnight plays went 4-0 for +4.21 Units. We won with St Louis +115 9-5 and LAA +106 6-2, Miami U 7.5-114 1-6 and Toronto U 9-113 6-0. We had two plays in college hoops and split. Winning with Auburn +5.5 97-80 and losing with LSU +6 63-80. Today so far we have 2 plays pending , both in MLB overnight sides. I have extended the time to qualify for this to 1 week from opening day. After that the special is no longer available. It also requires you to be with us through the end of regular season. The subscription price covers all sports I handicap during your subscription, and unlike most, it is a small monthly subscription where you can cancel at the end of the 30 days. Unlike many services that charge 4 figures in a lump sum for 1 sport. I have been doing this know for over 15 years and have many long time subscribers. Almost all of my new subscribers is by word of mouth as I do little to no advertising. This is purely a hobby for me. Its something I enjoy, otherwise I would not be doing it. My goal is not only to produce positive EV plays but also educate people interested in the minefields of sports betting. Its no easy task to beat the bookmakers. I would say of the universe of sports bettors maybe 1% successfully win consistently. And even then, variance is something you always have to be mindful of. A reading of my “required reading section” and my “FAQ” section should introduce you to these concepts. 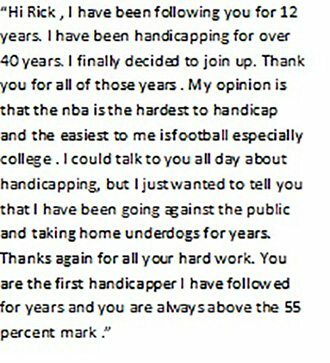 In addition, my 2+2 article on handicapping the NFL is an interesting read. Link is on top of the page. This site is very transparent. You can see the historical results from years ago on this site, and the last 3 years at google sheets, which I keep current daily. Email me for the link if you are interested. All plays are sent out via email, Twitter and Viber. All subscriptions have a 3 day free trial. Just pick the paypal menu and join us:) Hope to see you soon. February is now behind us and we picked up 10.45 Units for the month. A solid month and now we are heading into March Madness for College Hoops with post season tournament play and of coure the NCAA Tournament! One of the major changes I made in college hoops is I have disgarded in games where there was significant volume and very small edges. We are only going to concentrate now on games where the edges are solid and meet a threshold. That means less plays but as we have seen the variance has dropped substantially and the results have improved significantly. 90% of the plays are going to be overnight plays. They will be put out from 2 to 4 pm PST the day before. That means it is essential you have a book or better yet several that have the overnight lines out long before most books release them. The reason most books wait is these opening lines are soft. They are the softest of all sports. We have had two very good seasons betting these. And this season both the overnight totals and sides will be 1 unit plays. Its best to start looking now for extra outs. You can never have enough of these. In addition, you need to be ready to wager as soon as they come out. Last season they moved fast the first few weeks. Then , things settled down a bit and you had some time. Each season tends to work out different. So we will see how the timing goes this season. If your not going to wager on the overnights, take a break from sports betting , and take a look again when football begins. I do not anticipate a lot of regular plays, days place on the day of the game. However, there will be a substantial number of overnights. Also this season I am going to run the same special I ran the last 3 seasons. If I do not have a profitable MLB regular season I will refund you 50% of the subscription. The only requirements are that you have to be a subscriber from opening day until the last day of regular season. As I said I have done this the last 3 season and have not had to refund any money:) But you never know. I started this when I became confident enough in the overnights that I would put up half the subscription fee to show my confidence in my MLB methods. If you want to join us for a fun MLB season, just go to the Paypal dropdown on the site and pick the montly subscription. I will have you signed on the same day. If you sign up now, you can get the March madness NCAA Hoops plays as the subscription is all inclusive for all sports I handicap during your subscription period. If anyone has any questions I can be reached via email, or via Skype. My user name there is riccja. “Rick,I am still amazed how you do it. I have followed you almost from the beginning not only from your posting on your website but also you time at 2+2 forums. I have noticed a continuous improvement year to year in your methods. But the more remarkable thing to me is your persistence in educating and putting out your picks. Almost every site I am familiar with has gone by the wayside. Yet yours keeps getting stronger and stronger. I have to ask “Where do you get your focus and energy” to keep this up? You have taught me a lot over the years and I have gone from a “punter” to a reasonable handicapper. Whereas before I was a typical undisciplined sports bettor I am now very aware of the necessity of a disciplined approach. It has done wonders. In addition, you’re going from a free site to a subscription based site was long overdue. I appreciate your keeping the membership fee low and not trying to “milk” money out of the sports bettors. I know there are many that would pay substantially more to follow your site. But that goes hand in hand with your persona that you have established in the sports betting world. You most likely do not know it but your name “RickJ” is very well-respected as one of the leading handicappers in sports betting. In addition, your reputation for integrity is as high. There are very few real things out there but you are definitely the real thing. It’s hard for me to respond to that as humble a person as I am:) But it’s emails like this that I get from time to time that help keep me motivated. I have always said in the past that I approach sports handicapping the way crossword puzzle addicts approach their morning routine. I can not think of anything more challenging than trying to figure out EV on sports games. As far as the subscription cost I have mentioned before my goal was to defer my expenses that keep rising every year as I get more advanced in my techniques. 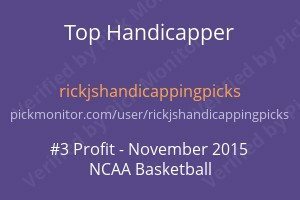 I look at subscribers as partners in this handicapping endeavor rather than customers. Subscribers help me defer my costs and allow me to justify keeping my expensive hobby going. Thanks for the mail. It’s nice to know I am appreciated!